Home CA Events Student African American Brotherhood Celebrates 25 Years of Meaningful Impact and Change, in L.A.
Student African American Brotherhood Celebrates 25 Years of Meaningful Impact and Change, in L.A.
LOS ANGELES, Calif. /California Newswire/ — The Student African American Brotherhood (SAAB), a 501(c)(3) educational organization, will host a black tie gala in celebration of its 25th anniversary on Saturday, Oct. 17, 2015 starting at 6 p.m. in the Renaissance Los Angeles Airport Hotel. The celebratory event will benefit the nonprofit with funds to support mentoring and development programs for SAAB participants, unite the organization alumni and supporters and honor its founder, Tyrone Bledsoe, Ph.D. The evening – “From A Moment to a Movement: 25 Years of Meaningful Impact and Change” – will begin with a reception where guest will have a chance to mingle with SAAB Participants, Alumni, board members, founder & CEO and the organizations national celebrity spokesperson Dondré Whitfield. That will be followed by a gourmet dinner at 7 p.m., an impactful program that includes live music by Jazz Pianist/SAAB Student Randiss Hopkins of Chicago, raffle prizes and an evening of dancing to the sounds of DJ Gamma Ray (SDSU SAAB alum). The black tie Gala is an opportunity to raise awareness and support the academic achievement and leadership development of young men of color who participate in more than 200 chapters across the nation, including several chapters throughout California, including the Los Angeles area. “It has been a privilege to lead the planning of this event, which has been as much about looking back at the many successes we have had as an organization over the years — as it has been about the work that remains ahead of us given the current climate of minority males in our country,” said Ronald Brigg, Ed.D, chair of the SAAB Board of Directors, which serves as the planning committee for the gala. SAAB relies on the support of educational grants and caring members of the community to fund its programs and research. Since it’s founding in 1990, SAAB has attracted national attention as an innovative prototype for personal and academic enrichment and has been featured in numerous books, journals and articles on the state of education for males of color. The ticket price for the party is $250. For information on how to purchase tickets (pre-registration ends Oct. 9): http://saabnational.org/25yrgala . 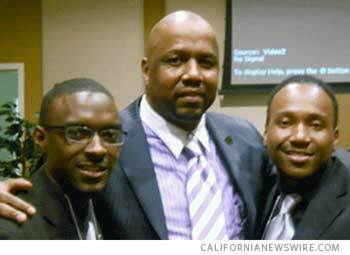 The Student African American Brotherhood (SAAB), a 501 (c) (3) educational organization, was founded October 17, 1990, by Dr. Tyrone Bledsoe at Georgia Southwestern State University to increase the retention and graduation rates of young men of color enrolled in college. Today SAAB and its affiliates provide a positive peer community, leadership development and academic enrichment opportunities to students in more than 200 chapters on university and college campuses, high schools and middle schools. across the United States. For more information about SAAB, visit www.saabnational.org.